Zillow, Trulia, Move: Show Us the Money! Our friends at 1000Watt recently took a comparative look at the Q4 earnings reports of real estate portals Zillow, Trulia, and Move Inc.
Move is still the big dog when it comes to raking it in, with nearly $200 million in revenue in 2012. Zillow came in with almost $117 million in 2012, while Trulia tagged up at just over $68 million. 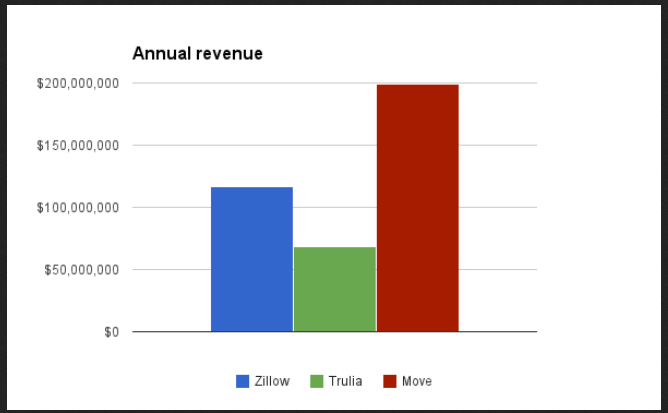 However, revenue growth gives the edge to Zillow and Trulia, with Move languishing far in third place. Indeed. We still find it dismaying that these listing aggregators are selling real estate professionals the right to market against, and receive leads from, their own listings – rather than monetizing the audience for those listings, the potential buyers. And they’re selling to a finite market – the 250,000 real estate professionals that Burslem defines in his post as potential paying customers. What happens when that supply runs out? The only option to boost their revenue at that point will be … to charge more. In addition, $267 a month isn’t chump change for many real estate professionals. What happens when it goes to $300 or $500? Will many current subscribers then find themselves priced out of getting leads from their own listings?